Enrollment for Miss Summer Beauty 2012 is now open. 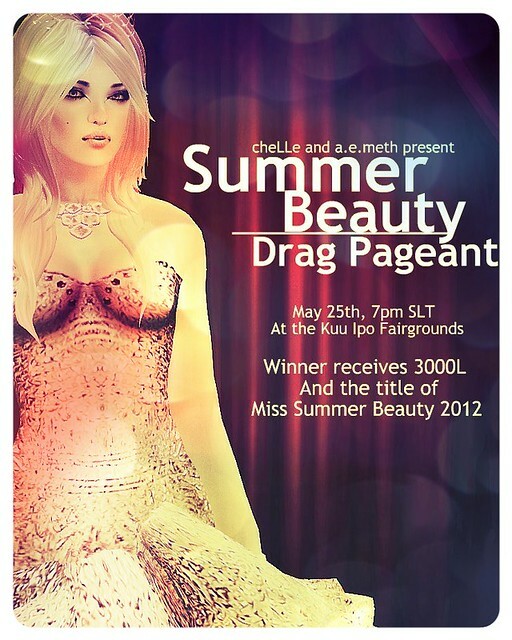 The winner receives not only the title of Miss Summer Beauty, but 3000L. 1. Please submit an entry picture to our Summer Beauty Flickr Group. In the picture’s description, please write your in-world name so we know who you are. Please only submit one picture–you can combine multiple panels in one picture for different shots, if you’d like. 2. Anyone can enter–but their avatar shape must be male, and dressed in drag. 3. Please use a skin that does not have much makeup on it. Bonus points if you start with a skin that is actually intended for men. 4. You have five tattoo layers you can use in Second Life. Utilize them! The tat layers can be of your own creation, or something you’ve bought from a store. 5. Have fun with your outfit. We want to see drag! Leave the pedestrian casual dresses at home. 6. At the same time, you don’t have to do the typical fishy-queen aesthetic. Show us some illusion and glamour, but be creative. Genderf*ck is fine, as long as it doesn’t look sloppy. 7. Winners must be present at the final ceremony. We not only want to see a photo, we want to see how your drag looks in person! Please don’t be too drastically different from your submission picture or else we won’t recognize you. 8. Anyone using morphs or excessive photoshop in their submission picture will be disqualified. If you have any questions, please contact Aemeth Lysette. A non-drag contest is coming soon!